So many examples exist within the realm of television of overlooked shows or underappreciated properties. Often, an audience dissipates after a series starts slow, because we live in a “What have you done for me lately” culture, as opposed to a long game. Patience remains a virtue, but in TV, if you’re not really good…really fast, you could be done. The entertainment landfill is piled to the skies with promising projects that struggled out of the gates, only to be given up on within weeks of their original premieres. The four major networks don’t have the luxury in this era of Peak TV to sit around and wait for a show to bloom anymore, because Netflix, Hulu, Amazon Prime, cable, and premium channels have continually changed the game. However, for an entity like AMC, quality generally trumps quantity. If a drama moves the critical needle, the executives can use that as enough of a case to keep a ratings-challenged show alive. Awards mean so much more for a cable channel, because that’s where class and depth are paramount. It’s about building an identity first. Mad Men was by no means a behemoth, but it was given time to grow, and Matthew Weiner’s show did just that. Vince Gilligan’s Breaking Bad was obscure and had almost no early penetration, but the performances and the unique storytelling infected the viewing public as each season progressed. With the exception of The Walking Dead and its less successful, but still popular spin off, nothing on the network has been a huge success from the outset. Even Better Call Saul, which has done well, is by no means a ratings juggernaut. But, because of the aforementioned triumphs, the truckload of hardware the “original two” received, AMC is hesitant to pull the plug on a creative effort in which it believes. Low Winter Sun didn’t make it because it simply wasn’t good, not because no one watched it. If the viewership is low, the show had better be exceptional. It wasn’t, so it was scrapped. Think of this way. Before Mad Men or Breaking Bad, would you have batted an eyelash when you heard AMC had a new drama premiere on the horizon? How do you feel about that same statement today? That’s what the brand structure and the reliance on quality means. “Netflix has its own shows? What the hell?” Then, after you fell in love with House of Cards or Narcos, just as a few examples, everything changes. Ozark suddenly becomes something you HAVE to check out, because it’s Netflix. That brings us to Christopher Cantwell and Christopher C. Rogers’ exceptional series, Halt and Catch Fire, which uses the personal computing and technology boom of the 1980s and 1990s as a backdrop for a story about five damaged, self-destructive people inescapably linked both personally and professionally. The reason the above explanation is instructive here is because, indisputably, the early episodes of Halt were not particularly strong. The pilot was decent, but the three episodes that followed presented unlikable, static characters that behaved in cliched fashion. There was the megalomaniac dreamer in Joe MacMillan, the tech geek in Gordon Clark, the punk rock hacker Cameron Howe, the far more intelligent than her job indicated Donna Clark, and the slick, but straight talking Texas executive John Bosworth. Yes, if you read the first two as Steve Jobs and Steve Wosniak, you wouldn’t be wrong, although much of the early stages of Halt and Catch Fire bore more in common with the founding of Compaq, and Apple exists in the show. Everything was on the surface, and the actions and words emanating from the characters were both predictable and often disappointing. What Halt had going for it from moment one was its talent roster, with Lee Pace, Mackenzie Davis, Scoot McNairy, Kerry Bishe, and Toby Huss all more than ready to shine when the camera was shifted in their general direction. Here, I stuck with the show because I was so intrigued by the premise of five people living in “Silicon Prairie” Texas, who all found themselves at the heart of the computing age explosion. What I never expected was how far this series has come, even though I was not surprised when it rapidly found its footing and escaped the obvious story tropes in favor of more obtuse, engaging angles. Joe MacMillan’s bisexuality felt right when it emerged, but it wasn’t a gradual move. Nor was it easy, particularly with the HIV scare last year. Broadly, in similar fashion to both Sons of Anarchy and BoJack Horseman (strange bedfellows to be sure), it’s not always prudent to throw in the towel on a show if there’s anything at all about it to like. Here, I dug the cast and the concept, and that was enough to stay on board at least through the end of the season. While there were still some issues at the end of that verse, there was much more to this song. I saw a show clearly trending in the right direction, and by the time the finale aired, I was all-in, becoming a major evangelist online pushing for its renewal. It was certainly not assured, but the news that Cantwell and Rogers were getting a second apple from AMC’s tree was the right move. A few weeks before Season 2 premiered, the network sent out screeners of the new campaign’s first four episodes. After navigating through them, I was blown away. Here, my instinct hadn’t just been rewarded, I had been provided a true bounty of dramatic television. 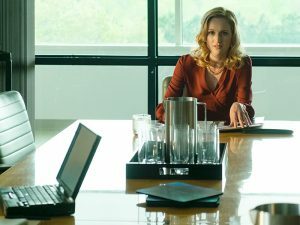 Season 2 of Halt and Catch Fire was phenomenal, with every character taking unexpected and engaging turns alongside a twisting, evolving story. What was most amazing about these five roles was how the writers managed to keep them true to the initial constructs, but still permitted such an expansion that they simultaneously were exactly the same AND entirely different. Season 2 centered around personal struggle, but also the infancy of Internet gaming, with Cameron Howe founding Mutiny and beginning her mentally unstable reign as a supervisor, rather than merely a creator. She’s never been able to handle the business side, because the artist in her has always taken over. That hasn’t changed in subsequent seasons, including the first three episodes of Season 4, which premieres this Saturday. In those hours, Cameron sees her professional position and reputation overhauled and turned upside-down, at the same time her private life has spiraled out of control. Unsurprisingly, Mackenzie Davis is astonishing as Cameron, as she always has been, but that’s really the case with everyone on the show. Scoot McNairy is tremendous as Gordon, and whenever any pairing, trio, or even the full group is together, the chemistry exists within all of them. This is the single most underrated cast on television. It’s true mainly because so few have experienced it, but as soon as you start watching, the talent flat out screams its worth to you. These people are incredible. Joe MacMillan is always looking for the next big idea, both for the ego and power side of it, but also because of how insecure and purposeless he is in his life, unless Cameron is in a no-ghosting phase. He continues his rocky professional relationship with Gordon Clark and remains as scatterbrained as ever, but his new obsession is on “indexing the internet.” I’ll leave it there, but you can read between the lines to figure out what we’re leading to here. Through four seasons, Joe has been the sizzle behind an early model Apple and IBM competitive personal computer, the infancy of the web, one of the first protection and security software suites, and now he’s attempting to battle with America Online and MCI for bandwidth and user base. Originally, he was a Don Draper ripoff. Now, he’s so much more, and Lee Pace brings out the best in the role. But, though I find much of the professional pitfalls and successes of the show the most entertaining, the real heart of the series is within the complicated, unhealthy relationship between Joe and Cameron. It’s on display early and often in Season 4, and that pairing’s fate will likely be one of the last things Halt does before it hits ESC. It’s arguable Joe-Cameron is featured too prominently in certain stages of Season 4, but if there’s a Ross-Rachel, a Ted-Robin, or a Don-Every Woman He Meets on this show, it’s these two. But, what’s most interesting about Season 4 is the result of the time shift. Without giving too much away, Donna has moved into a completely new place in her life, both personally and professionally, and she’s now a shark, rather than plankton. Kerry Bishe is just superb playing this woman struggling for importance and respect, and she’s never been better than she is this season. However, the same problems and challenges that have defined HER insecurities are still peppered throughout almost all of her scenes. That’s what makes Halt and Catch Fire so unique. All five main characters, certainly including Toby Huss’ John Bosworth, all hold both money and control at various times, but each one is still the same shaky, near-basket case he or she always was. Money doesn’t fix everything, nor does power. In fact, in many cases, it only exacerbates the problems. For Boz, he’s ultra-vulnerable and grasping for anything to make him feel alive again. Power corrupts. Absolute power corrupts absolutely. In Halt, the players are never fully corrupt, but their self-interest and image issues lead them to rash and often painful decisions. Gordon Clark, when he’s channeling his inner Wosniak, is brilliant. He was never happier than when he was working on the HAM radio or tinkering in his garage. He can have a good time playing Super Mario Kart with Cameron, but even with an amazing birthday party that comes early in Season 4, he’s still miserable in much of his life. He’s also somewhat paranoid, and his scary brain and health issues linger. His younger daughter, Haley, becomes a key figure in Season 4 as well. Susannah Skaggs does an excellent job playing the awkward, apprehensive teenager, who plays an important role for both her family, and actually for the professional side, and it comes from a rather unexpected place. It’s one of those additions that comes from a creative group always ready to diverge from what’s conventional to tell a better story. Annabeth Gish returns, as does Donna and Gordon’s older daughter, Joanie. Kathryn Newton is cast brilliantly to play the rebel that quietly seeks normalcy and hopes to find common ground and love in her own family. Again, a rebel with a different strut, which helps to keep the character from being overly predictable at every turn. Some moves are obvious, but many aren’t. If you like Halt and Catch Fire, Season 4 doesn’t skip a beat from Season 3. In the three episodes presented to critics, the show provides a sense of where its headed, but leaves many unanswered questions to deal with in its final command lines. There’s an intriguing time jump and some bouncing around, and there’s a bit of a Sorkin Steve Jobs feel to the series’ entire layout, when you look at it from an era perspective. Catching up with Joe, Gordon, Cam, Donna, and Boz is always a treat, but the drama surrounding all five primary characters has never been higher. Season 3, at this stage, remains my favorite of the run, but Season 4 likely has some more tricks up its sleeve. If you have never watched Halt and Catch Fire, it’s sitting there for you on Netflix. You can watch the first three seasons (30 episodes) and then be set for the final year. It’s a binge-worthy series. It’s a show that has grown and improved upon itself, setting a very impressive bar in 2016. You no longer have any excuse to overlook it. If you like unique, great period drama, Cantwell and Rogers have provided it in terabytes. This is the best show you probably aren’t watching. Fix it. If you bailed early, fix that too. Set in the past, but foretelling more about the future than we may ever have thought, Halt and Catch Fire is one of television’s best dramas. What once was a buggy release is now a market leader and a critical darling. It’s a killer app. I’m @JMartOutkick… C://JMART_OUTKICK “chkdsk” for errors.